The new model should reduce the company’s dependence on mega-seller Apple II. However the project progressed very slowly, partly because Steve Wozniak did not play an active role in its development anymore. 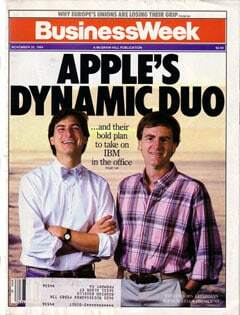 After a plane crash with his Beechcraft Bonanza in February 1981, Woz had largely withdrawn from Apple. Therefore, it was Steve Jobs who at this stage provided strategic directions in Apple’s technology. He was neither an inventor, nor an engineer or programmer. But Jobs was able to estimate the implications of new technology concepts much better then anyone else. Steve Jobs’ masterpiece in technology scouting took off during the event of Xerox PARC. As early as 1979 he had visited with a small team of Apple developers the legendary California research center in nearby Palo Alto. He had the chance to look into the future. “They showed me really three things,” Jobs said in 1995 in a TV interview. “But I was so blinded by the first one I didn’t even really see the other two. One of the things they showed me was object orienting programming they showed me that but I didn’t even see that. The other one they showed me was a networked computer system…they had over a hundred Alto computers all networked using email etc., etc., I didn’t even see that. I was so blinded by the first thing they showed me which was the graphical user interface. I thought it was the best thing I’d ever seen in my life, ” Jobs said in an TV interview in 1995. At Xerox PARC Steve Jobs had seen the light. Now, he also wanted to build an Apple computer that was easy to operate. Apple had bought admission to the Xerox Research Center PARC through a stock deal that appeared to be very lucrative to the narrow-minded Xerox managers on the East Coast. Xerox was allowed to buy 100,000 shares of the Apple start-up company stock before the public offering for a million dollars. In the short term, this deal was worth it: By the time Apple went public a year later, Xerox’s $1 million worth of shares were already worth $17.6 million. But in the long term, Xerox lost the chance to become an industry giant like Microsoft or IBM because the work of their researchers in California had been ignored internally. Larry Tesler, who was then a Xerox employee at the presentation of the GUI to the colorful Apple group, was fascinated by the visitors who looked like hippies, “After an hour looking at demos they understood our technology, and what it meant more than any Xerox executive understood after years of showing it to them.” Steve Jobs took a similar view: “Remember, it was very flawed, what we saw was incomplete, they’d done a bunch of things wrong. But we didn’t know that at the time but still though they had the germ of the idea was there and they’d done it very well. Within ten minutes it was obvious to me that all computers would work like this some day.” He was right. Ten years later, when it dawned on the Xerox managers that they had served the intellectual property of their researchers at PARC to Apple on a silver plate for such a small sum of money, they went to court. In December 1989, Xerox sued Apple Computer and demanded $150 million in damages. The case never went to court as potential claims from Xerox were now time-barred. In 1983 Apple made the first attempt to introduce the graphical user interface to the mass market by launching the model Lisa. In ads the new computer was promoted with remarkable software such as “Maserati for your brain”. However, it never came to be a financial success. The price of $10,000 was far too high to convince the many prospective buyers to purchase the computer.